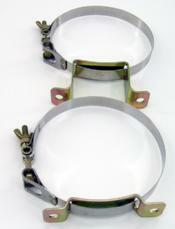 These stainless Nitrous bottle brackets are made of quality stainless and plated steel throughout. They have quick disconnect hardware so bottle removal can be done fast without the use of any tools! Comes with mounting hardware. They come in a pair and will fit all 5LB nitrous bottles like, DynoTune, NX, NOS, ZEX, TNX etc... One bracket is taller than the other to position the syphin tube in the lower corner, picture shown two short brackets (mistake).